Giving a speech during the opening. Cho has today survived the first round of the 5th Chunlan Cup. Looking back at his recent success in the Samsung Cup, and his lack of success in the major Japanese tournaments, I started wondering whether Cho has made a turn in his career. In a recent interview just after his victory in the Samsung Cup he said that he had never been very successful in the International tournaments before, because in the first place he was too busy with his Japanese tournaments, and secondly because he was unfamiliar with the shorter time limits. But now he said, he was getting better playing with a three hour time limit. In any case, as we go through the list of Japanese tournaments, Cho is playing in a few only. He is in the Meijin league, but lost his first game there. He is absent in the Honinbo League, he lost the final of the 3rd preliminary. He lost the playoff for the Kisei, so he will quite probably play in the Kisei League next year. First game in the 5th Chunlan Cup against Kong Jie, analysing just after black resigned. The game lasted only 160 moves, but it was the last to finish this day. Cho must have been in byoyomi for a long time. He lost his first game in the Oza, and is absent in the Gosei. He is also absent in the preliminaries for the 17th Fujitsu Cup, the only Japanese sponsored international big event. Will we see more of Cho in the other (Korean and Chinese sponsored) international tournaments? Will he play in the Ing Cup (if there is one)? 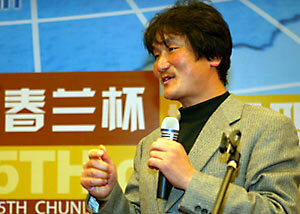 I hope so, otherwise 2004 will become a year without many games by Cho Chikun to publish. The next game will be on December 31st. 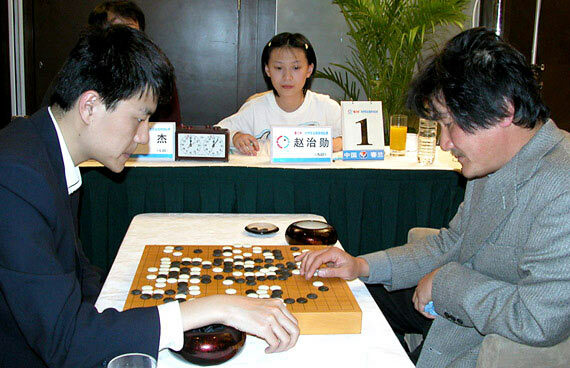 The second round was almost a complete victory for the Chinese players. They wiped out all Korean players except Yi Ch'ang-ho. The only Japanese player left is Cho U. So Cho Chikun lost in the second round. Again, exactly 160 moves. His opponent was Hu Yuayo, who took revenge for his loss in the 8th Samsung Semi-final. That leaves many uncertainties about Cho's plans and program for next year. We will have to wait how they will unfold.